“The Ten Things I Like About Me” is one of a variety of fun exercises where we practice positive self talk and build our self esteem. Alas, so much of counseling and self-help time is spent discussing the things that are going badly. What about the things that are good or great?! In this example, I am going to use myself because frankly I too need to practice positive self talk and build my self esteem. 1. Really nice person – will go out of my way to help others. 2. In good shape because I eat good food and exercise. 3. Can do a variety of kinds of work very competently – counseling, preaching, flowers, animal care, and more. 4. Good wife – I try to do (at least) one nice thing and say one nice thing to my hubby everyday. 5. Good enough mother. I pray for my kids every day and contact the ones who live away at least once a week. 6. OK daughter. I call home regularly and have taught my kids to respect their grandparents. 7. Model employee. I always do extra and am very concerned about my co-workers as well as my clients. 8. Excellent student. I am always learning something new – on purpose. 9. Have a four inch smile. In fact, I once won a smiling contest. 10. Generous. I support many good causes with my time, talent and treasure and prayer. 11. Determined. I have experienced my share of disappointments but I always come back for the count. 12. Whole hog. I don’t do anything by halves. If I am going to do something, I jump right in. 13. Vegan, which is gentle on the earth as well as the other-than-human animals. Once you have written this out, I want you to add a picture of something that makes you feel happy just to look at it. 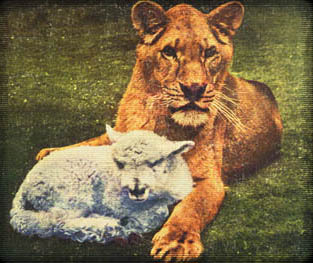 I have a passion for peace hence the very real photo of the lioness, Little Tyke , with her friend the lamb, Becky. Next, I’d like you to print off a few copies, put each in a plastic sheet protector, and put it in places where you will see it. In the front of your organizer, beside your bathroom mirror, on the fridge, etc. You and I – we cannot build a healthy home on muck. We’ll sink. We need a solid foundation – knowing that we are loving and lovable, unique and yet an integral part of this world. Build positive self esteem with “the Red Sweater Lady.” Watch the series of short helpful clips.